Reading – Our 5-year-old will continue in All About Reading this year. Last year was my first year with this program, and I was able to review all three levels since I took my 7 year old through them at a fast pace, to reaffirm that he had mastered the phonics rules. I love it, and the way it works hand-in-hand with the All About Spelling Program. Even better, the kids all love both Spelling and Reading. They beg for that time each day! I think part of it is that they get one-on-one time with me. This time really only takes about 15 minutes, so it is not time-intensive, but rather just personal. At reading time, the kids generally sit on my lap on the floor and we work through their lesson together. When my older son reached the lessons with a story out of the readers, all of the kids would voluntarily stop what they were doing to listen to him read on the couch. The stories are great. Another thing I appreciate is that the readers are a true graduated reader. What I mean is that many of the "readers" out there introduce all kinds of words that use phonetic rules the student hasn't yet mastered at that point. These readers only use words already mastered, so the student reads with confidence, and you are able to review anything the child needs a refresher on, without getting into new concepts. They are great! Spelling – All About Spelling of course! The oldest two – my second and fourth graders are using this. (Level 2&3 and 4&5, respectively). YES! LOVE, LOVE, LOVE IT! Open-and-go resource. Plenty of built in repetition if needed. My son loves the magnetic tiles, and my daughter loves to write on the whiteboard. They also just spell things verbally. I love how flexible, visible, and hands-on it is, all while being very simple to use. Grammar – My second grader will be working through First Language Lessons Level 3. My daughter completed it 2 years ago and she loved it – in fact it was her favorite subject! In this curriculum, we use the CC memory work information when it comes to definitions of things. TIP: We downloaded all the English Grammar songs by NoGreaterJoy on CC Connected for all cycles so that we have all of the CC definitions and can use them with our grammar studies. This year my daughter (10) will be starting the Classical Conversations Essentials program, which includes a grammar component called Essentials of the English Language. This resource is purchased directly through CC for those enrolled in the program. Math – My kindergartner will be using Math-U-See (Alpha Level). We love this program, especially for younger hands-on learners! I used Alpha and Beta levels with my older kids in the past, and have been happy with it. We use Singapore each summer as review, which I think works well. My second grader will be using Saxon Intermediate 3 this year, and the fourth grader will be using Saxon 5/4. Since we complete two math curriculums per year, I enjoy the opportunity to expose them to a variety of ways of looking at the language of numbers, orders, and systems. In addition to math texts, we do math drill to increase our speed and accuracy. We use a free online tool from www.Xtramath.org. Takes just a few minutes a day, and the kids look forward to doing this work on the computer. Writing – My kiddos in K & 2nd will be using the Prescripts series from Classical Conversations this year for their copywork. My fourth grader will be beginning Essentials, and will therefore be working through the methods introduced in the Student Writing Intensive from Institute for Excellence in Writing, specifically using the U.S. History Based Writing lessons. 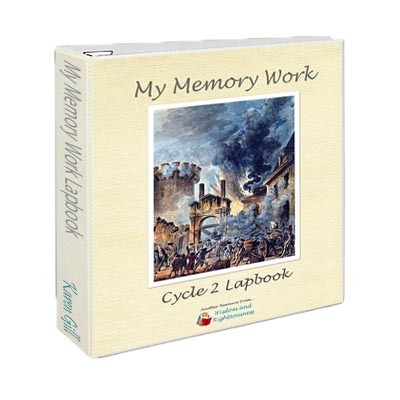 Portfolio Fun – We will also be using the My Memory Work Lapbooks as a hands-on tool to record our Memory work! I love having this for review! Piano – The oldest three kids and I take piano lessons in our home. The kids use the Mozart Mouse Alfred series, and I use the Adult series by Alfred. We all enjoy piano! 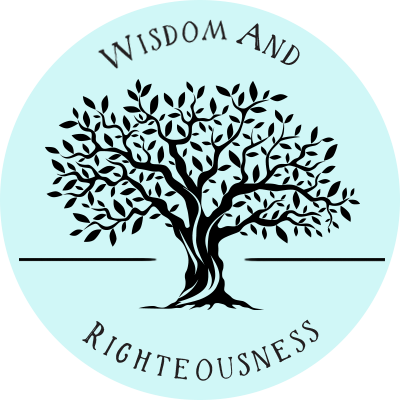 Bible – For study, we will be using "Who is God" by Apologia. I have been waiting for my kids to be old enough to start this series, and am excited to dive into it! After this is "Who am I?" and then "Who is My Neighbor?" Character / Habits – After a number of years of planning to make up our own family's more detailed plan for expectations / rules coinciding with scripture, I have decided not to reinvent the wheel and instead to use the resource "Our 24 Family Ways" by Clay and Sally Clarkson. We are on Family Rule #4, and it is going well. Thank you to CC which has taught me repetition and hand motions to help memorize. I think this program is perfect for a classical model. You review the same rule for five days with suggested discussion questions, corresponding Bible passages and discussion, and suggested prayer. So far even the 3 year old can recite: "#1 – We love and Obey our lord Jesus Christ with wholehearted devotion. #2 – We read the Bible and pray to God every day with an open heart. #3 – We honor and obey our parents in the Lord with a respectful attiude." Easy 15 minutes of family Bible time. Science – Generally, I do not add a separate science curriculum outside of our CC memory work, but I wanted to try it this year since both of my older 2 kids have been through Cycle 3 before. I have always been interested in the Apologia resources, and this sounded easy to squeeze in, especially once I found a resource that has the science experiment supplies pre-packaged and labeled. I like the idea of having an open-and-go resource that incorporates scripture when talking about the value of human life and how we are created. Since we are studying the Human Body in CC, I chose Exploring Creation with Human Anatomy and Physiology. This will be considered "extra" for us, and as such, it may be put aside if we do not have the time, and we can work on it next summer as time permits. 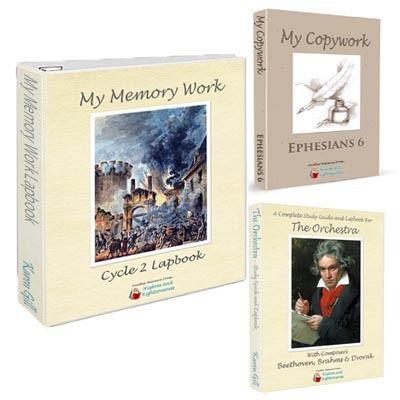 Greek – In addition to continuing to review our Greek Memory work, I am adding a biblical greek curriculum geared towards younger students this year to improve mastery. Best thing is that all of the reviews says it only takes 15 minutes a day. That sounds perfect for us! Reading – the Bible and lots of great books! I have so many great U.S. History books, historical fiction, biographies, etc, that it will be VERY difficult narrowing it down!!! I am hoping to focus on the Christian Heroes Then and Now series for Mom's read-alouds, as well as Lamplighter books and a few historical classics. The kids have a huge stack of historical fiction, related science books, etc to dig through during the year. Projects – Art DVD's, Resources from Homeschool in the Woods. These are purely extras for days we want something different and hands-on to do, or snow days, weekend activities, etc. We will always focus on our Memory Work, Math, Language Arts and read-alouds. Everything else is optional. At night many times I will have the kids listen to Mystery of History audios. I love they way she demonstrates a love of the gospel from Creation to Revelation! This is our plan, always subject to change and bend as the year progresses! I am hoping to have a couple of upcoming posts to show what our school day schedule looks like, and also how I organize everything to be ready for the school year. I love that as homeschool parents we get to choose what is best for our kids, or families, and the season of life we are in! While I post this for those who are interested, be sure and choose what works best for you and your family. There are a lot of great options out there!